Amazon offers two music streaming services i.e. Prime and Unlimited. Music Unlimited is not a part of Amazon Prime subscription program. It provides 10+ million tracks. The subscription fee for this service is $8/month for Prime/Non-Prime users. Prime Music is a part of Amazon Prime. It has a library of 2.2+ million tracks. The subscription fee for the same is $12.99/month in the US and Rs 1000/year in India. Amazon Prime not only promises 1-day product delivery and unlimited music streaming but also gives you access to original content i.e. TV shows, podcasts, latest movies, etc. If you’re in India or the US, Amazon Prime is a great deal. Amazon allows you to stream music online. It has also launched a dedicated app which you can download on your IOS or Android device. The size of the app is 53 megabytes. The application lets users log in with the email address and password they use for logging in to Amazon.com. The app displays a list of languages when they log in. Once users select their preferred languages, the Amazon Music application will open its main UI. The main interface of Amazon Music app has a dark grey background. The color of the text is white. The interface has a bottom navigation bar with four options/tabs i.e. Browse, Recent, My Music, Alexa. Browse: The Browse interface of Amazon Prime Music app is divided into several subsections. It displays the latest, popular songs/playlist and a list of radio stations. Non-Prime users can browse the playlists, see the album cover/art, but they can’t play the songs. Recents: Here, you’ll find the list of songs you’ve listened, added to your library/collection, and downloaded recently. Amazon Alexa: Amazon’s personal digital assistant utility is baked into the Amazon Music app. Alexa obeys voice commands. Hence, instead of typing the song name or lyrics, open the Alexa utility and hum the lyrics or name of the song you want to listen. My Music: This interface of the Amazon Prime Music app enables you to create new playlists. It also allows you manage the playlists, albums, tracks, and genres you’ve bookmarked. The My Music interface displays an option to select listening mode i.e. online or offline. Can the app play the MP3/MP4 songs you’ve downloaded from other websites? Yes, it can! The app has a built-in music player with which you can play the songs saved on your mobile device. Playback controls: The app enables you to pause, stop and skip the current track. It also allows you to change the order of the songs and shuffle the playlist. The music playback control options are hidden. To see them, long press the play button of music player. 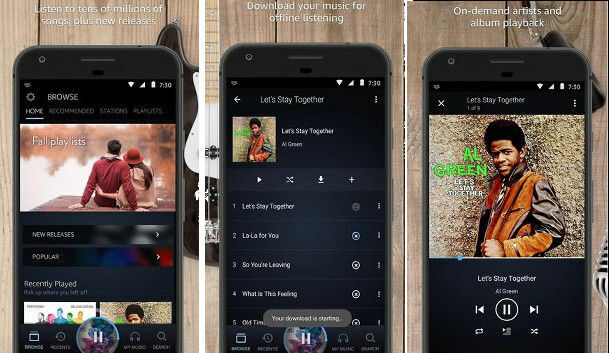 Playlist: Like other music streaming apps, the Amazon app provides 100s of playlists. You can filter the playlist by mood or song genres. The app lets you share and bookmark playlists. It also allows you to download songs from the playlist. Amazon Prime Music app detects your internet speed and sets the music playback quality automatically. If you’re not satisfied with the streaming quality, you can change it manually from the settings interface. The settings panel includes an option to delete the cache files the app has generated and saved on your device. The Amazon Music application ships with a sleep timer utility. To make sure that the app doesn’t play songs when you’re asleep, you can configure this utility to stop playing the songs after 15, 30, 45 or 60 minutes. The Amazon Prime Music app’s settings interface lets users select the storage hardware where it should save the downloaded music files. The app displays the amount of free space on the ROM and MicroSD card. Thus, you don’t have to open the Android OS settings interface to see the available storage memory on the MicroSD card or the internal storage memory. No option to switch from dark to light theme. If you’re living in the US, you have a plethora of good alternatives to try i.e. Spotify, Pandora, Netflix, etc. Users based in India can try out JioMusic, JioTV, Wynk, or Netflix. Well, tech giants Apple and Google have also launched their premium music subscription service. If you’re not satisfied with any of the services we’ve mentioned above, give a try to Google or Apple Music. The Amazon Music app has a dark-themed UI. It is fast and easy to use. If you're searching for a music streaming service that lets users download songs, try out Amazon Prime Music.